A woman looks at job advertisements on a wall in Qingdao West Coast New Zone in Shandong province, China, Jan. 17, 2019. 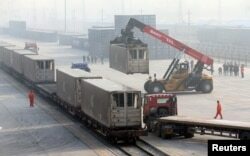 Workers unload containers from a train at Dahongmen Railway Station, Beijing, Jan. 14, 2019. FILE - A worker disentangles wool yarn at a spinning machine at a factory owned by Hong Kong's Novetex Textiles Limited in Zhuhai City, Guangdong province, China, Dec. 13, 2016.